No Fenders -Formula 1, IndyCar and A Whole lot more..: Vettel becomes Sports yyoungest ever Dreibettzimmer Weldmeister! 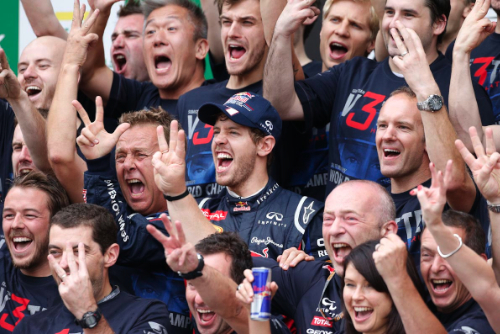 Vettel becomes Sports yyoungest ever Dreibettzimmer Weldmeister! And in the sports history, only nine men have ever become triple world champions, beginning with the likes of El Maestro, nee Juan Manuel Fangio; 1951, 1954-57. Then the sport waited another nine years for its second man to this pantheon - named “Sir Blackjack,” aka Jack Brabham; 1959-60, 1966. The ‘Aussie was then followed by thee ‘Wee Scot, better known as Sir Jackie or JYS, aka Jackie Stewart; 1969, 1971, 1973. And I know I’ve scribbled this before, but, I’ve been a huge fan ‘O Vettel’s ever since the day thee precocious “12yr-old” teenager, actually 19 took to the track in Friday practice at Istanbul, Turkey and was promptly issued a speeding ticket for his unbridled exuberance exiting Pitlane! Yeah, I know everybody says it’s the car, I mean C’mon, its gotta be the car, right? As unfortunately the season’s so damn long that I cannot remember it all, not to mention having boycotted watching Vettel’s first ‘W of the year in Bahrain. Along with having missed Spa. Yet for Mwah, not only the race of the year, but the drive of the year came at Abu Dhabi - where after Red Bull had unbelievably run the German’s tank dry... ‘Seb started from Pit lane and blitzed his way thru the field not once but twice to wind-up third and most notably making Fernando swallow the canary by thinking where in thee HELL did he come from? And Vettel proved he could come from the back again, passing traffic in dodgy conditions at Sao Paolo en route to a sixth place finish to capture the title by three points - one place ahead of his childhood hero Michael Schumacher. And let’s not forget that Vettel shoulda-woulda-coulda - most likely won the European GP in Valencia if the alternator hadn’t failed whilst leading, as I believe Vettel had two alternator problems this year? As the last one I can remember was Mark Webber’s failure at Austin. 2011: Vettel becomes Youngest ever Double ‘Weldmeister!